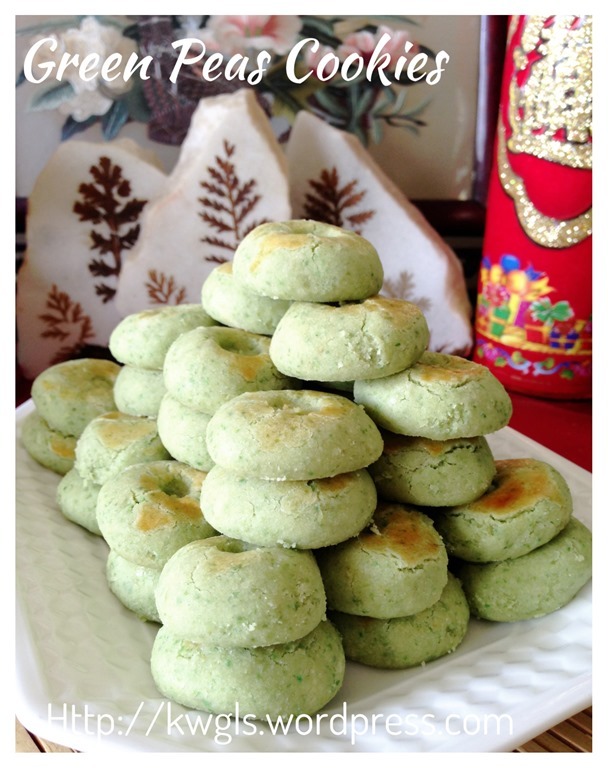 I am sorry that the post have delayed for quite a while as I was busy preparing some other cookies.. Chinese New Year is a period where cookies were served to guests and I found that there are just too many cookies being sold in the market. I have a bad habit of stopping by cookies store whenever I passed by. I will browse through the cookies sold and found the recipes that I have yet to issue a post. In fact, I found that there are just too many cookies that I have never blogged even though my E-book already has more or less 25 recipes. 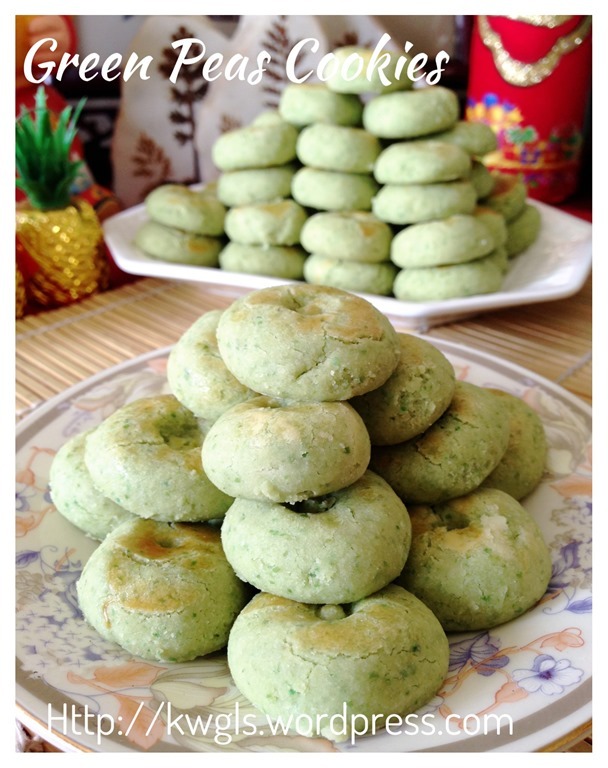 One of them is this green peas cookie. I remembered many years ago when I first saw it in Singapore, I bought one bottle and gave it to my brother as gift. He loves it but I have forgotten until I read it in Facebook Group recently. I told myself I must give it a try.. In this illustration, I have grind my own green peas. I have used the coated green peas which is not really advisable. 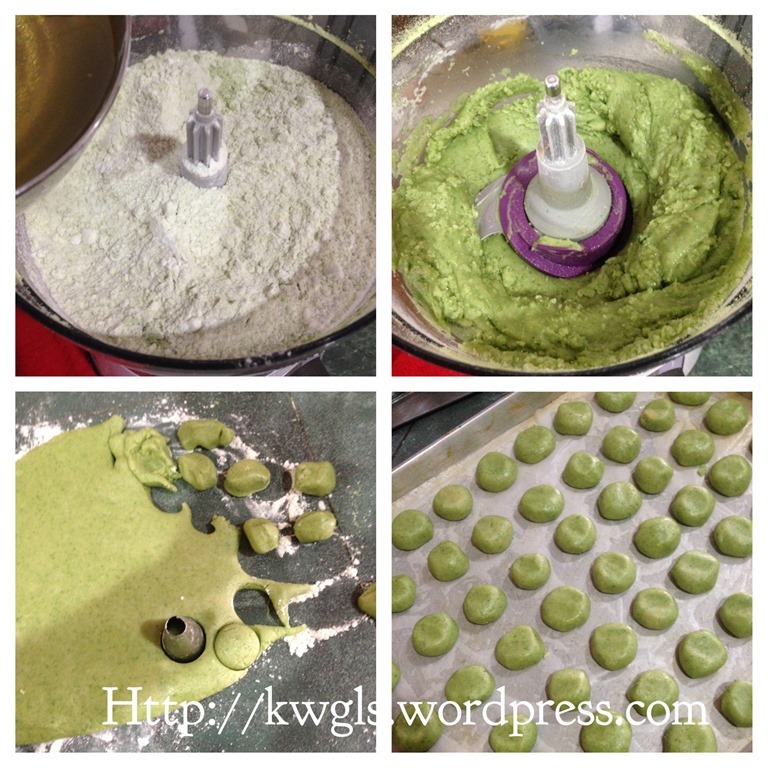 If reader can get the non-coated green peas, it will be easier. 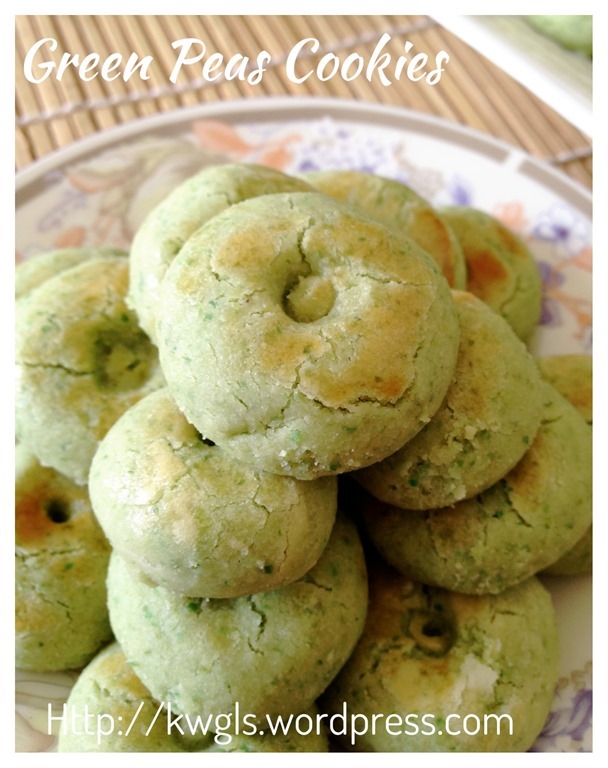 If you can get hold of ready processed green peas flour, this recipe will be a very busy recipe.. 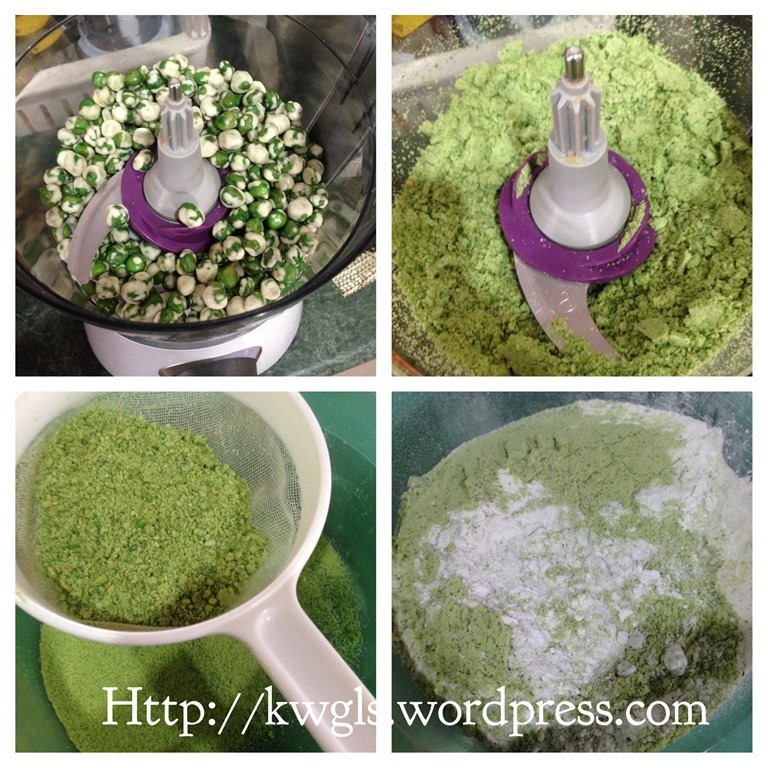 In a food processor, blend the green peas until as fine as you can. 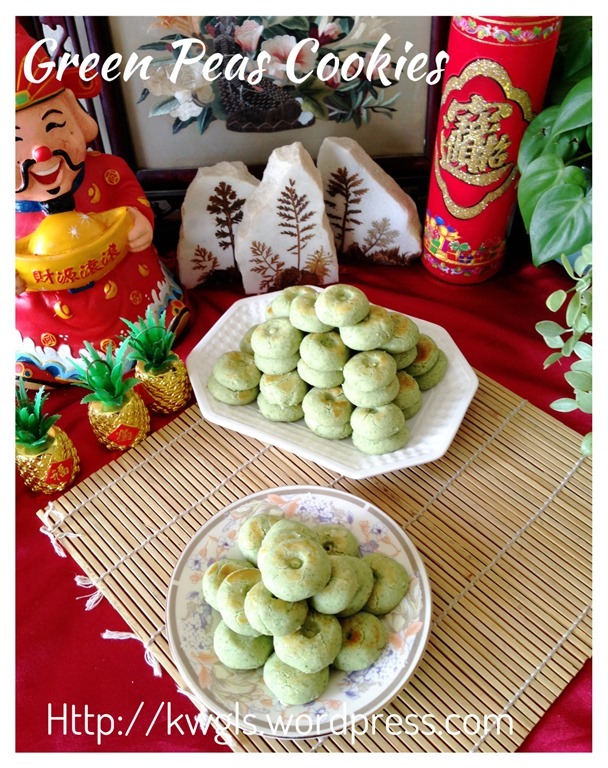 Sift the blended green peas powder to a bowl of icing sugar, corn starch and plain flour. Transfer the flour mixture back to the food processor, add the cooking oil or peanut oil gradually, blend until it forms a pliable dough. Transfer out to a lightly floured surface. Roll out flat and use some cutters to cut into smaller pieces. 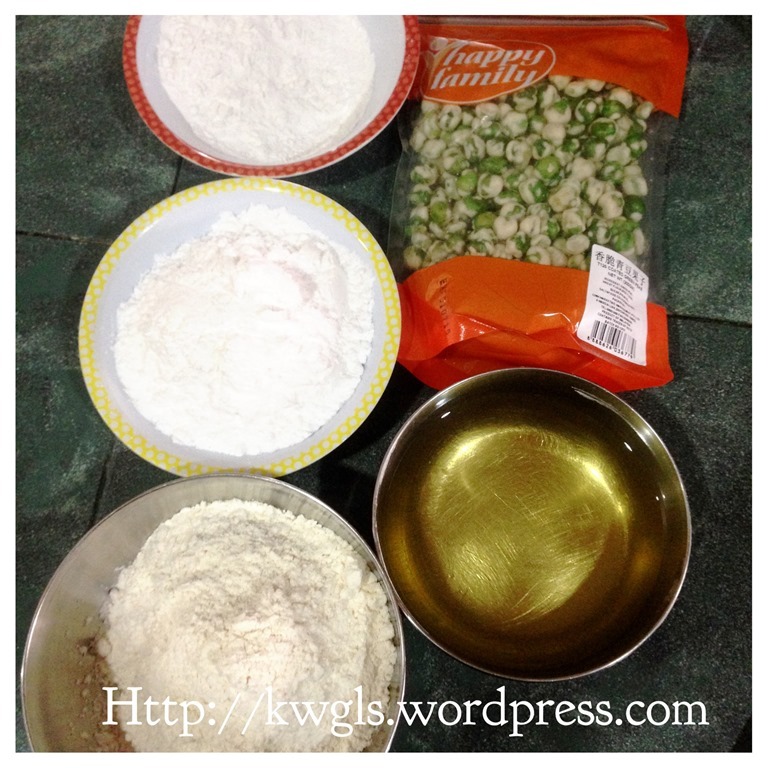 Gather the sides and perform the same until all the dough are divided. Take a portion, shape round and slightly press down using your finger. Egg wash the cookies using beaten egg yolk. Use some utensils (chopstick, satay stick etc.) to create your desired pattern. 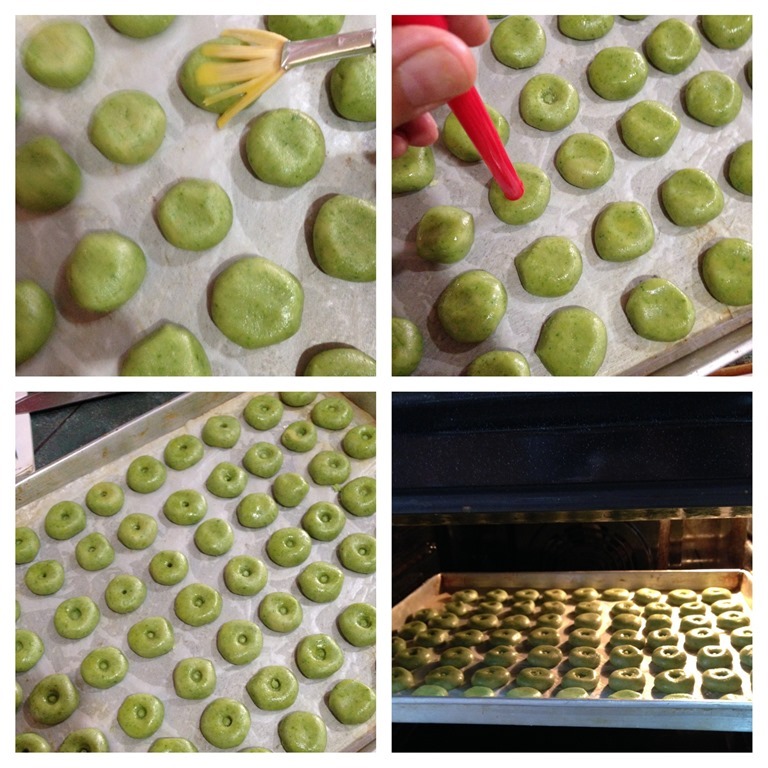 Bake in the pre-heated oven of 170 degree Celsius for about 15-20 minutes or until your desired colour tone. Your cookies will be rather fragile when hot. Let it rest in the baking tray for 5-10 minutes before transfer to a rack for complete cooling. Once completely cooled, store in an air tight of container. 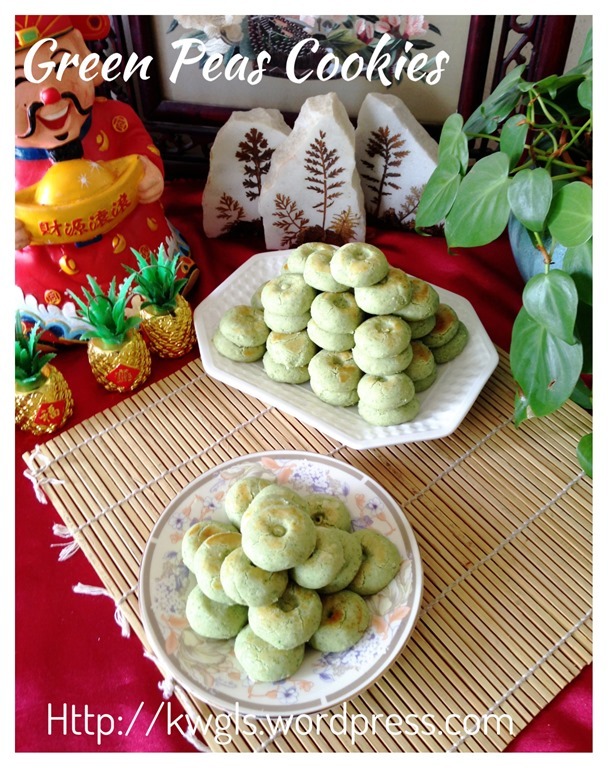 Colour of the cookies will depend on the green peas you used. Some are very green whereas some are lighter. 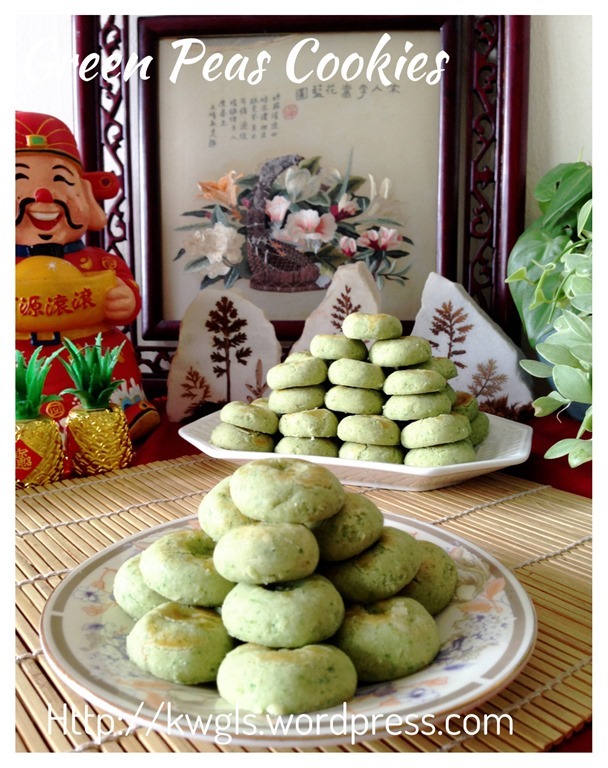 If prefer, you can buy the ready processed green pea powder in the bakery shop. 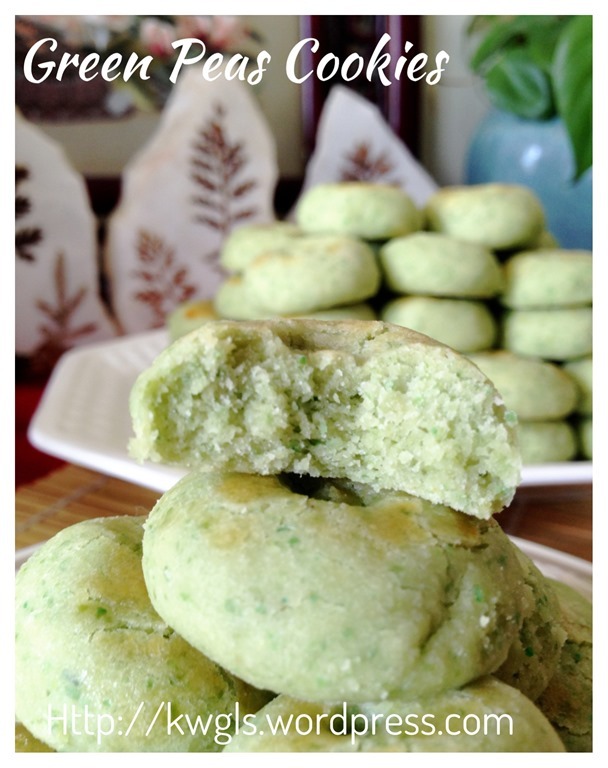 This cookie is rather easy to prepare if you use ready processed green pea powder. Remember that if you are able to find green peas without coating, please use that… It is melt in the mouth if handling are light and baking time is correct. Over baking of this cookie will make it hard. 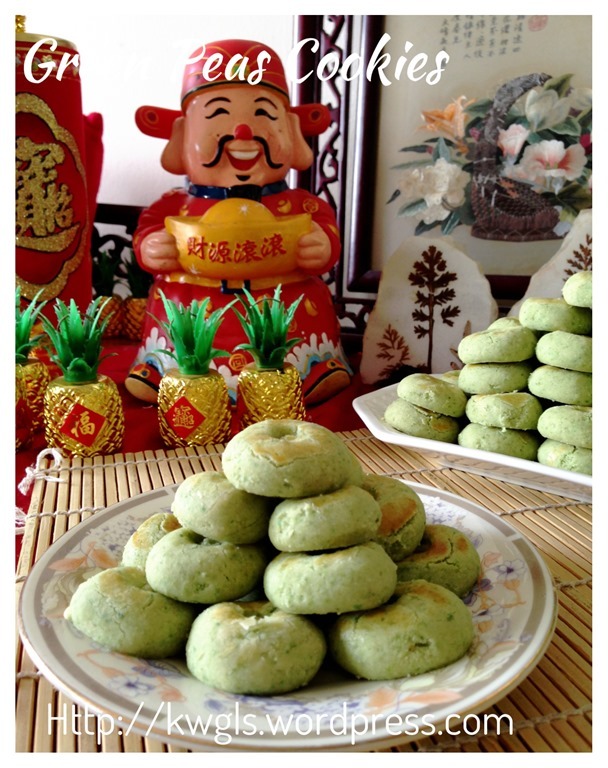 This entry was posted in Cakes and cookies, Chinese and Asian Cakes and Snacks, Chinese New Year 2014, Food Preparation Series and tagged 8, chinese new year 2015, 青豆饼， green peas cookies, GUAI SHU SHU, Guaishushu, kenneth goh, postaday. Bookmark the permalink. 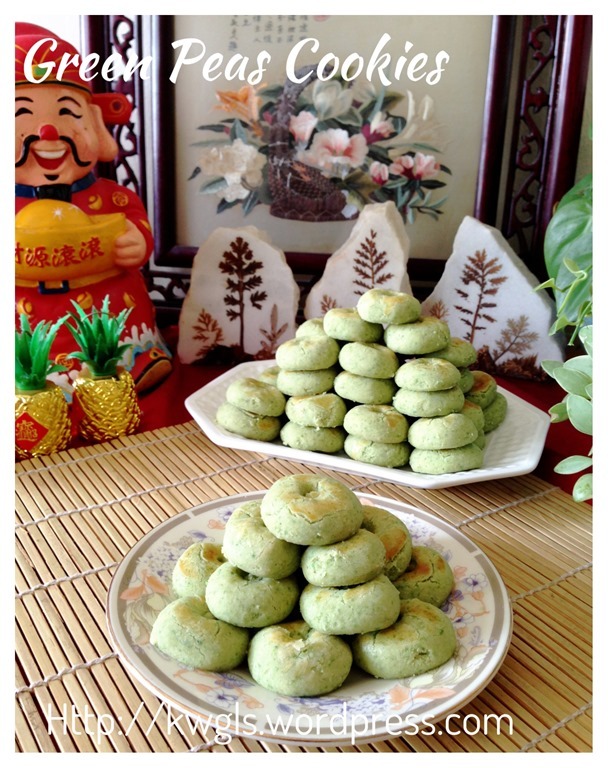 Where can I get green pea powder? 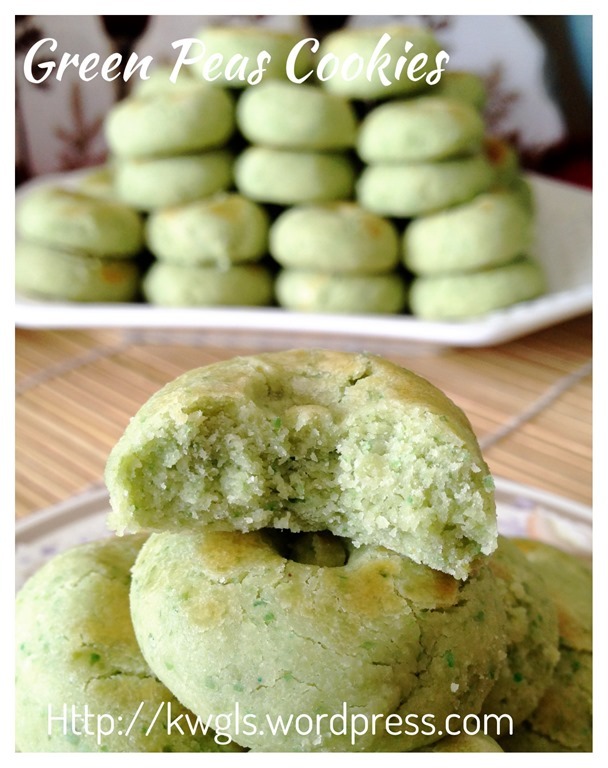 I have seen another recipe just use plain flour without adding cornstarch/potato starch. Just wondering what’s the difference in adding the cornstarch into it?